When you taste fideos–slightly fried pieces of broken vermicelli mixed with meat, seafood and/or vegetables–the combination is so natural that it seems strange to think it has an origin. It feels obvious; the sweetness of clams, the acidity of wine, and toasted pasta with a nutty flavor taking on the creamy texture of a risotto. Surely this is something Southern Italian have made at times, yes? Then you discover that it’s a traditional recipe in Tex-Mex border cuisine (albeit typically with beef), and the world gets complicated. To figure out fideos, you have to go back to the 5th century A.D. and follow the evolution of pasta varieties from the Arab world. Sometimes it takes a village to make a recipe. Other times, it takes half the planet. It is both beyond the scope of my recipe and my interest to pick a side in the never-ending argument over the origin of pasta. There are recipes from the Etruscans, Romans and Greeks predating the Arab introduction of pasta in those regions, but there’s not enough detail in the recipes to really distinguish pastry from pasta. It’s a silly argument, anyway; given that the basic pasta consists of two ingredients and that there were at least two, and possibly up to five, independent origins, arguing over who put water (the earliest pastas didn’t use eggs) in flour first is kind of pathetic. So please understand that I am talking here about one particular branch on the evolutionary tree of pasta, not the root. 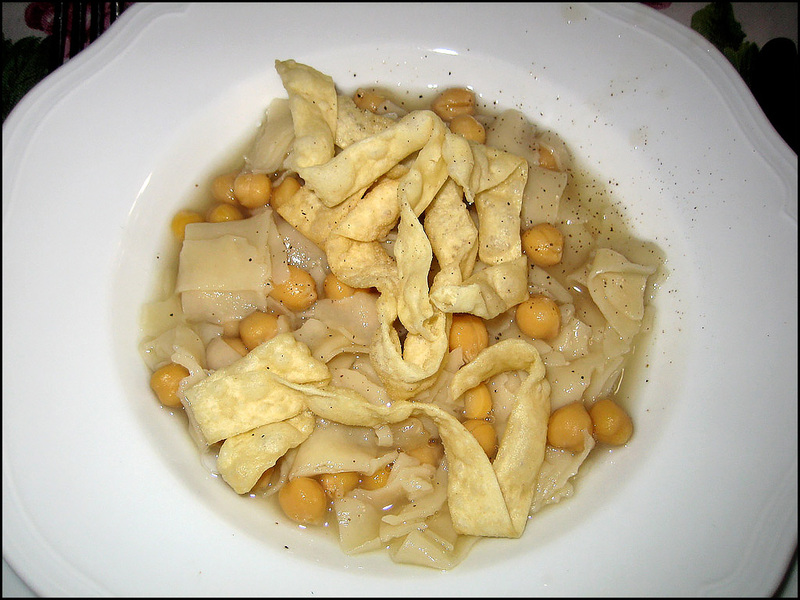 In Southern Italy, the name lives on as tria, the Pugliese dialect for tagliatelle, and the dish cicieri e tria, or pasta with chickpeas. Some of the pasta is fried in oil, adding texture to the finished product, which is another nod to its roots in the Arab world, where frying is a common treatment. In Iran, India, and Pakistan, for example, the most common treatment for these noodles has historically been a dessert, where they would be fried in clarified butter, then cooked with honey, cardamom, raisins, and water. The Armenians took the noodles and incorporated them into their pilaf, a fact that would become crucially valuable to American cuisine after World War II. 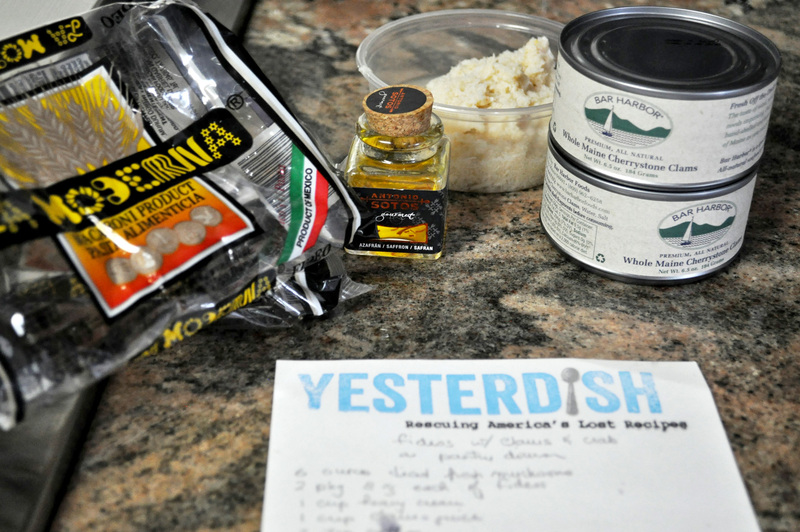 In San Francisco, Armenian immigrant Pailadzo Captanian taught Lois DeDomenico how to make an Armenian pilaf. 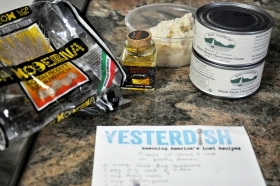 Lois made her husband Tom DeDomenico, son of the founder of the Golden Grain Macaroni Company, a dish of rice and macaroni based on Captanian’s recipe. In Catalonia, the local dialect took the name fideu for the noodles, and in the early 20th century, it took on a new dimension as fideuà. The legend goes something like this: Joan Batiste Pascual was a teenager on fishing boats around the 1930s, and he had the job of cooking rice and seafood for the fisherman, who would serve themselves out of a common pot. The Captain had a habit of taking quite a bit more than his fair share. Pascual thought he’d be clever and use broken pasta instead of rice. It was clever, but not for the reasons he’d hoped; his “paella of pasta” was a hit and remains a regional specialty today. How or when these iterations came to Mexico, no one can say; certainly by the 1960s, sopa di fideos was a well-recognized recipe. In North Mexico and the border with Texas, however, a non-soup version called fideos a la cazuela, or pan noodles, was more common. Of course, that’s a lot of words once you hit the border, so in Texas, it was just fideo or fideos. Brown vermicelli in hot oil very slowly. 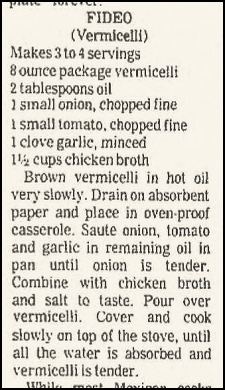 Drain on absorbent paper and place in oven-proof casserole. Saute onion, tomato and garlic in remaining oil in pan until onion is cooked tender. Combine with chicken broth and salt to taste. Pour over vermicelli. 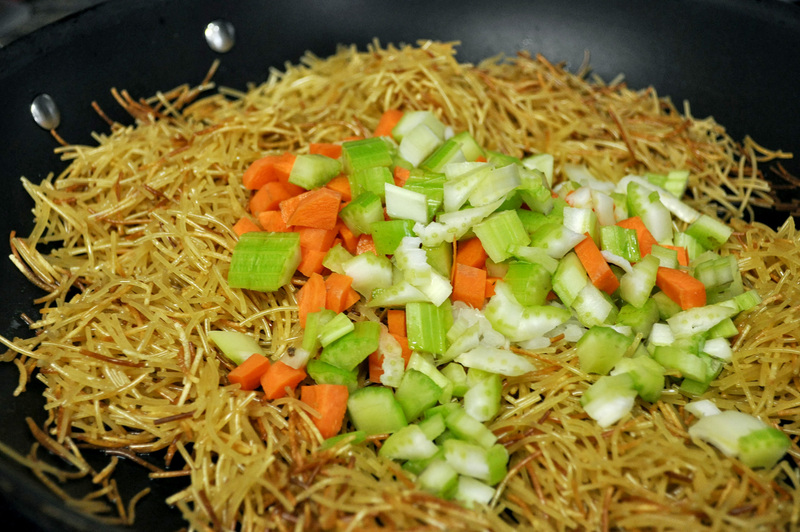 Cover and cook slowly on top of the stove, until all the water is absorbed and vermicelli is tender. 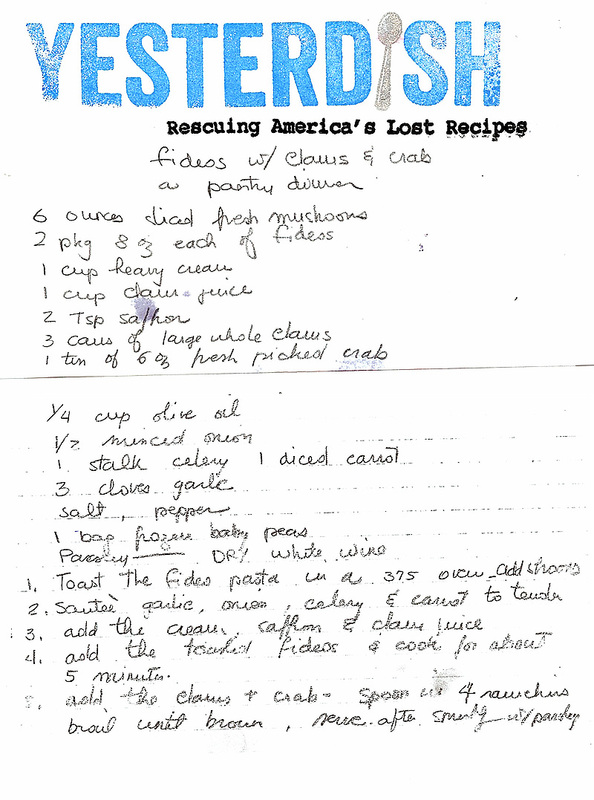 The recipe ended up in my mom’s collection in the 1970s, when a group of college friends went to El Paso to support one of their members who lost his father. Before the wake, everyone went over to the friend’s house to cook meals and relieve the burden on the family. My mother started to make a risotto. “What’s fideo?” she asked. 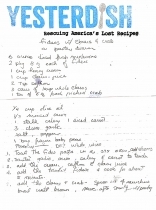 He provided the recipe and the group tried it before they returned to school. We’ve had it at the family table for years, although we didn’t really know what we were eating. 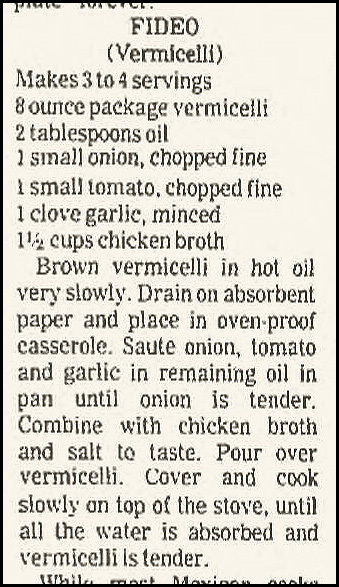 One oddity of the original recipe is the inclusion of cream. While this isn’t present in any fideos recipe I’ve seen, cream or sour cream is sometimes an ingredient in some arroz con fideos (rice and pasta) recipes from Mexico and the Dominican Republic, particularly those that include pork. In a vegetarian iteration, however, arroz con fideos is basically identical to Egyptian bil shareyah, another parallel development in the evolution of Arab/Latin pasta. While fideos may have had a long strange trip to the table, it’s a reflection of pasta’s versatility and appeal. 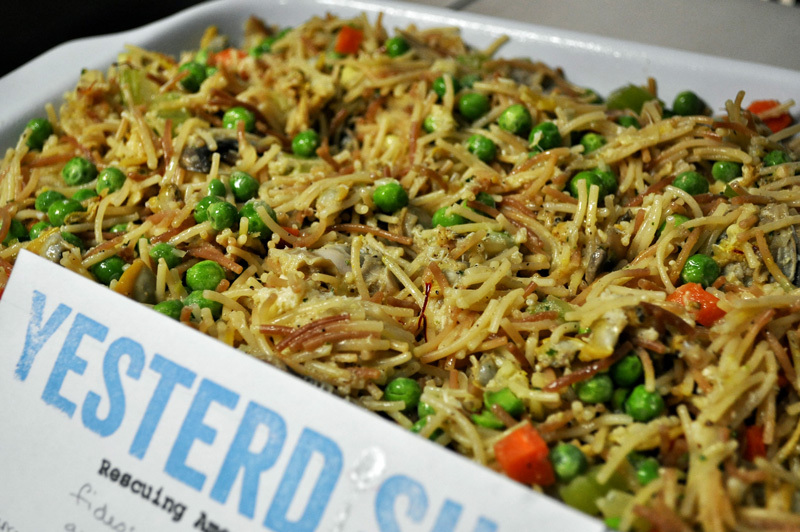 You could make a fideos with any combination of protein or vegetable you wanted; it wouldn’t surprise me if right now there’s a vegan cowboy fixin’ himself some seitan fideos over a campfire somewhere along the Pecos River. … well, it would surprise me a little. But it would be delicious. *Or just very difficult to pronounce. Note: This is the original version of the recipe my mother was given years ago, but not what we typically do in making fideo. I’ll give the modern version underneath. 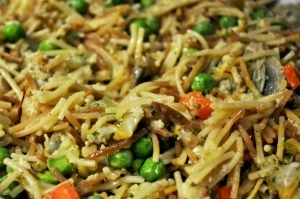 Toast the fideo pasta in a 375 oven; add mushrooms. Saute garlic, onion, celery and carrot until tender. Add the cream wine, saffron and clam juice. Add the toasted fideos and cook for about 5 minutes. Add the clams and crab–spoon in 4 ramekins. Broil until brown. Serve after; [finish] with parsley. Note: The card above is what’s in my mom’s recipes. This is what actually happened in the photos, though. 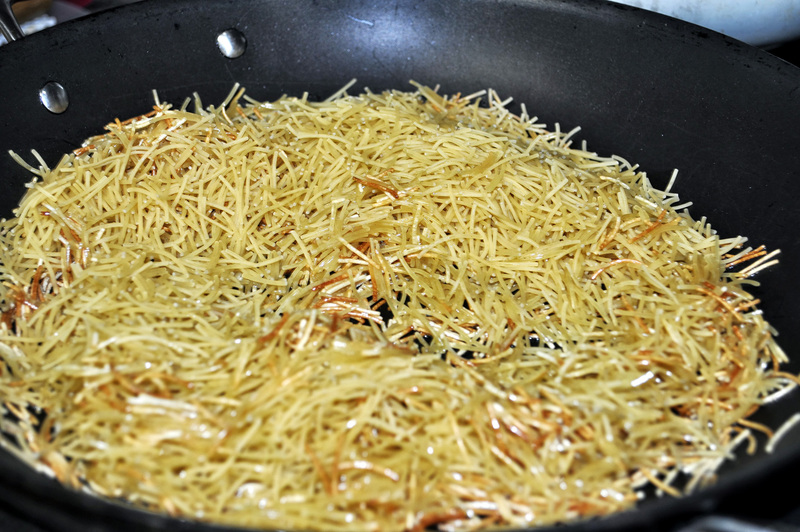 Saute fideo in olive oil. When it starts to brown, add garlic, onion, celery, and carrot; saute until vegetables are tender. Add the wine, saffron and reserved juice from clams. 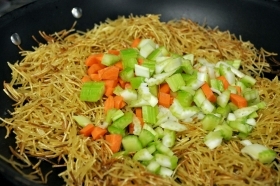 Cook until liquid is absorbed and fideo pieces are tender. Add in the peas; stir and cook until peas are thawed and warmed through. 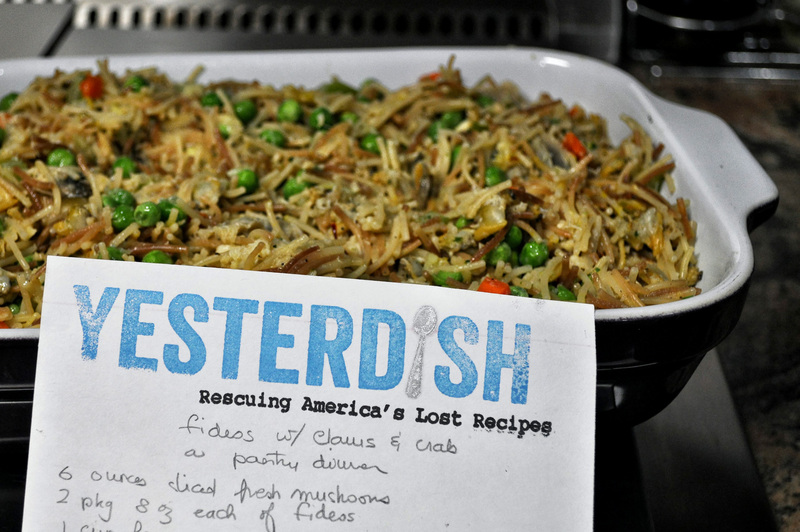 Stir in the clams until warmed through; pour into casserole. If desired, top with parmesan and brown in the oven [we didn’t] or top with parsley and serve. A popular brand’s popular pie crust.